Glow into spring with high-shine glosses, eyeshadows, and sprays. Sephora’s new March makeup launches will enhance your inner glowy goddess. Drunk Elephant’s surprise skincare product will also leave you with radiant skin so you can Slaai all day. 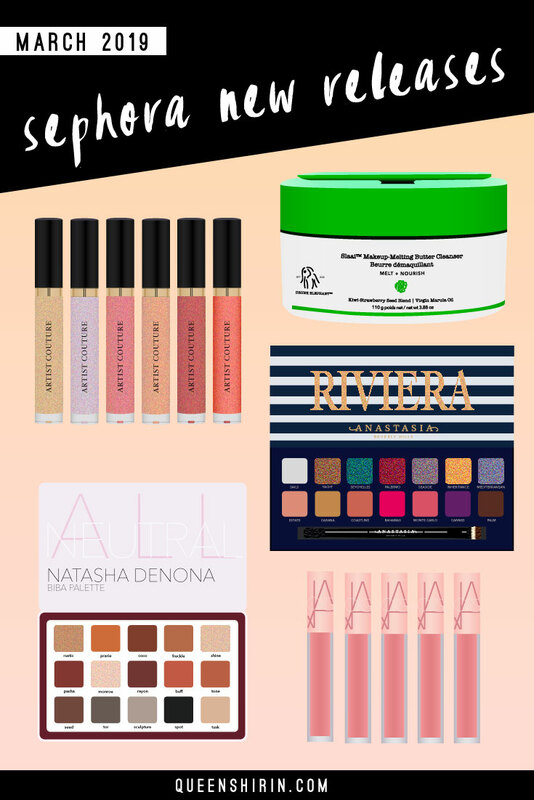 Here are my top ten picks of new Sephora releases for March 2019. This list is organized by release date. Make sure to sign up for email notifications at Sephora.com to get notified when these products launch! Refresh and enhance your makeup with the relaxing fog mist sensation of Glow Recipe’s Watermelon Glow Ultra-Fine Mist, made with hyaluronic acid to plump skin and hibiscus flower AHA to gently smooth skin. We now have Dipbrow pomade in gel form! Create fuller and more defined brows with this waterproof formula lasts up to 12 hours. Dipbrow Gel comes in 11 shades to match the pomade lineup. Create fun, colorful looks and everyday looks with the new Anastasia Beverly Hills Riviera palette. From purple and pinks to yellows and blues, this is the perfect palette for someone who loves neutrals, but wants to start playing with color. Available in six shades, Diamond Lip Tease is a high-shine gloss that is made with hemp oil to keep your lips moisturized and comfortable. Lock in makeup all day with Milk Makeup’s Hydro Grip Primer, which plumps and smooths skin for an even canvas. The oil-free and silicone-free formula is tinted green, but applies clear. Huda Beauty’s Rose Collection Power Bullets features eight shades with intense pigmentation and maximum comfort. The diamond shaped tip on the bullets allows for easy application. Introducing the Biba Palette, Natasha Denona’s first all neutral palette with a cream powder black eyeshadow. This palette is a permanent addition to her line and contains cream and powder formulas. The cult classic NARS blush shade we all know is now available as a sheer, tinted lip oil. Made with raspberry seed oil and pomegranate extract, this lip tint nourishes and softens lips. This limited edition Pat McGrath kit comes with one Angel Dust loose pigment, a mini eyeshadow palette featuring six shades, and the FetishEyes mascara so you can get the signature high-shine PMG look. Slaai is a makeup melting cleansing balm that transforms from oil to milk upon contact with water to gently remove makeup and sunscreen. Fruit extracts and oils soothe skin while the built-in Bamboo Booster provides physical exfoliation that can be used a few times a week. Which Sephora new product launch are you most excited about for March 2019? I can’t wait to try Drunk Elephant’s Slaai cleanser!